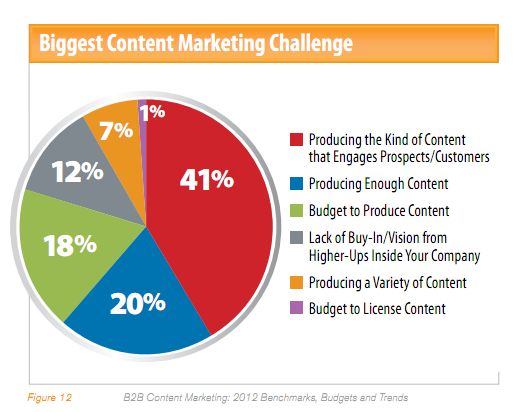 What’s your biggest content marketing challenge? For one out of five marketers it’s producing sufficient content and for another one out of five marketers, it’s having enough budget to cover the cost of content marketing according to Content Marketing Institute and MarketingProfs’ September 2011 research. So what’s a marketer to do? In short term you may be able the shift budget and resources from other marketing and communications, but chances are that you’ll still need more content and budget. This is essential since content marketing thrives on being constantly refreshed. Public relations. PR is a department focused on getting your company’s name in third party media. As part of this function, they regularly create new content, including press releases. Customer service. As your organization’s front line engaging with prospects and customers, they know what questions your target market wants answered. Further, they’ve got systems in place to collect inquires and standard answers you can use as the basis for content. At a minimum, get customer service representatives to tell you what questions are being asked and the answers given. Sales. Like your customer service department, your sales force is engaged with prospects and customers. 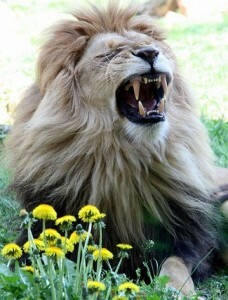 They know what the customer pain points are and what resonates with them. Investor relations. While this department isn’t on everyone’s content marketing list, they should be. They’re the curators of your organization’s required reporting and are constantly talking to your investor community. Executives. Who is the face of your firm? Are they giving speeches and other programs that can be repurposed? Events. Does your company hold special meetings or conferences for clients or the public? If so, how can you tap into this wealth of content? Think powerpoints, video and photographs. Employees. Allow employees to contribute to your content creation. This helps your organization in multiple ways. It gives a different view on how your company works and allows individuals to stretch themselves. Invite customers to contribute to the community. Ask customers to contribute to your content marketing. Of course, you can’t state it that way or they’ll be put off. Here are some suggestions. Request customers participate in your company bulletin boards to help answer other customer’s questions and get answer to theirs. Bear in mind that these answers may not always be on your website. Think broadly across social media such as LinkedIn, Yahoo Answers, and others. Provide an area for customers to show off their creations, handmade products, or just using your products. You can allow anyone to post, you can require membership or you can curate the content. At a minimum, you need to have guidelines to ensure that the people uploading the content have the right to do so. Think social media tribe. Before diving in just to get free content, it’s critical to understand that social media engagement has its own set of rules. You need to think in terms of paying it forward and reciprocating; if someone does something for you, you need to return the favor. Invite guest bloggers. Get other bloggers to share their content with your readership. In this case, bloggers care about getting their content published and reaching a new audience. Spotlight customers. It’s not just about you. Let others know about your wonderful customers without it being a sales pitch. Find out more about them and how they relate to your offering. Interview others in your sector. This can be done via video, audio or text. Get well known people in your market to share their point of view with your audience. Leverage your community. In today’s social media environment, marketers often overlook real life events and groups. Think about your local neighborhood where you’re physically located as well as other business related communities and associations. Reach out to local community groups to create relevant content. Think local news. Participate in appropriate associations. They can provide links as well as general information in your area. Work with distributors and suppliers. These firms have a vested interest in attracting new prospects to your products. Take advantage of free content! How can you beat free content? From a business perspective, much free content may lack the voice, branding and quality your content marketing requires. Despite this, it’s a good starting point for growing your content offering. Verify Creative Commons and copyright. Don’t assume that you can use someone else’s work just because it’s published online or on a blog. Just doing a Google search for images doesn’t hold. It must say that the work can be used for commercial purposes. Flickr is good for selecting this type of images. Use government-produced content. There’s a lot of information that’s publically available at Data.gov. But remember if it’s free for you, it’s free for your competitors as well. So try to make some sort of enhancement to it or present it in a better way. Check out the Library of Congress as well. Extend your charitable efforts. Many corporations support one or more charities. If your firm is one of them, brainstorm how you can use this connection to expand your content marketing. Help publicize the not-for-profit. Package their content to appeal to your audience. In so doing, you can provide a service for your prospects and customers since these associations are often have a mission related to what you do. Distribute the not-for-profit’s content. While you may not be able to repackage the content or integrate some of the content into your offering (with their permission of course! ), you can help expand their reach. Test one or more of these low cost ways to help support your content marketing. In addition to providing new content, they’ll cause you think differently and to see your content in a new light. Do you have any other suggestions for creating cheap content marketing for your business? How to make your content spread like wildfire. How to get your content distributed. Tags content, Content Marketing Institute, MarketingProfs, Research, Tips. Bookmark the permalink. You did it again, Heidi. Love your content.